With the technological advancement in the digital marketing sector, email marketing has suddenly flourished and become the reliable means of business promotion and customer targeting. But in order to extract maximum results out of these email campaigns, you must incorporate a reliable SMTP server. While choosing the best SMTP server for your mass mailing needs, you must keep in mind that it should send emails at much greater speed, offer high deliverability rates and can be easily integrated. There are tons of SMTP service providers who claim to fulfill these criteria but this blog narrows the list down to 5+ Best SMTP servers which are also 3X cheaper than the rest. The all-in-one mass mailing solution offers various features but the built-in SMTP server is the prominent one. Since the SMTP is pre-installed, you are exempted from the heavy task of SMTP integration. Apart from pre-integrated SMTP server, MailGet Bolt is also known for its bulk emailing services. MailGet Bolt provides valuable insights on several email campaign metrics like open, clicked and unsubscribed rate. The bulk emailing software also helps you to achieve maximum open rates with the help of auto follow up functionality. MailGet Bolt has been very generous with its pricing plan. The service offers multiple pricing plans with unlimited emails sending capabilities but only limiting the recipient’s factor. You can go with the 30-day FREE plan where you can send 300 emails per day. $9/month which allows you to send unlimited emails to 2,500 subscribers. Similarly, $34/month increases the subscriber’s bandwidth up to 10,000 with unlimited email sending ability. The mass emailing software also provides you the option to avail the services by paying on an annual basis which in turn would also grant you 2 months FREE access. If we’re talking about best SMTP servers than SendinBlue definitely counts in. It is used for sending both transactional and marketing emails. 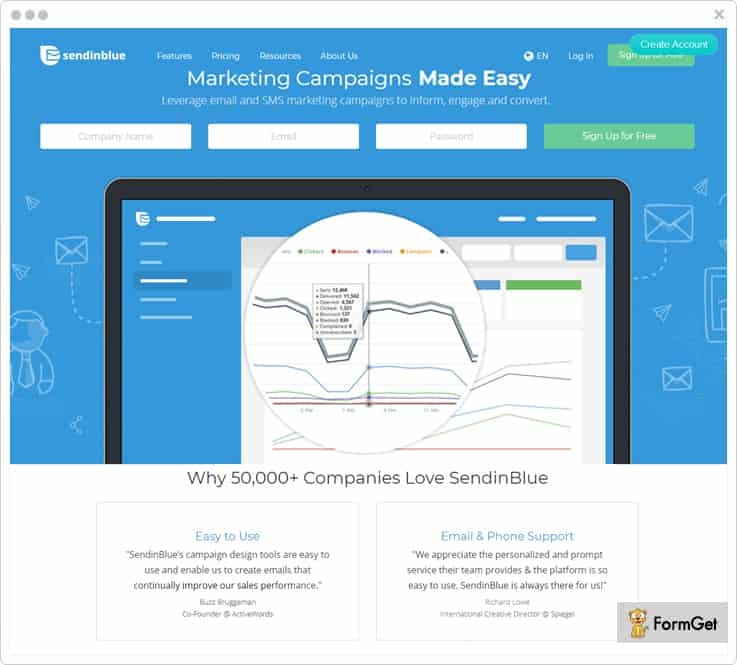 SendinBlue provides all tools required for managing the email marketing campaign. And the most important part is, it provides SMS marketing as well. It effectively controls the bounce rate and doesn’t let your emails die in the spam box of a user. SendinBlue also provides the complete report of your open emails, click rate, bounce rate, and even deliverability rates. It even allows you to integrate with PrestaShop plugin, WordPress plugin, Magento plugin, Drupal plugin, and custom subscription forms. Free: In this plan, you can send 300 emails per day to unlimited contacts. Lite: It will cost you $21.84 to send up to 40,000 emails for a month. Essential: Without any sending limit for a day, you can send up to 60,000 emails in a month at $33.34. Premium: In the premium plan, you can send 120,000 emails at $56.33 and 350,000 at $148.29. In fact, you can check the send time optimization, edit your landing page, increase your workflow with unlimited automation, and use free dedicated IP. Enterprise: The pricing of this plan is customized, so you can change it according to your need. It is best suitable for agencies, and big scale companies. With this plan, you can have an account manager and other benefits. Pepipost is one of the finest SMTP service which provides best inbox rates of your emails. You can send the emails in a flash, & deliver all the critical emails on time. Additionally, you can get the live delivery status of the emails in a matter of minutes. Further, the service is highly secure as it uses email protocols like SSL & TLS encryption which protect your data. You can easily track open, click through rate, etc of your emails with the help of real-time tracking feature of Pepipost. With the help of a simplified account management system, you can add various sub-accounts with different sending domains under one account. It instantly notifies you about the hard emails bounces via email so, you can monitor bounces at your end. Pepipost provides different pricing plans which are varied on the basis of the number of emails. You can send 100,000 emails per month at $15. Also, if you want extra 1000 emails you have to pay an additional amount of $0.60. At just $65, you can send 300,000 emails per month along with all the essential features. Further, you have to pay $0.55 for per 1000 extra emails. Pay only $145 and send 500,000 emails per month along with prioritized support. Also, you can get 1000 extra emails at just $0.50. Send 1000,000 emails per month at only $245 along with advanced features and a 24/7 support system. Moreover, you can get 1000 extra emails at $0.45 only. turboSMTP can very well answer the question – which is the best SMTP service provider for bulk emailing? The SMTP server can be easily integrated to achieve maximum delivery rates of marketing and transactional emails. This SMTP relay service provider proudly talks about their compatibility with other major bulk emailing software and services. 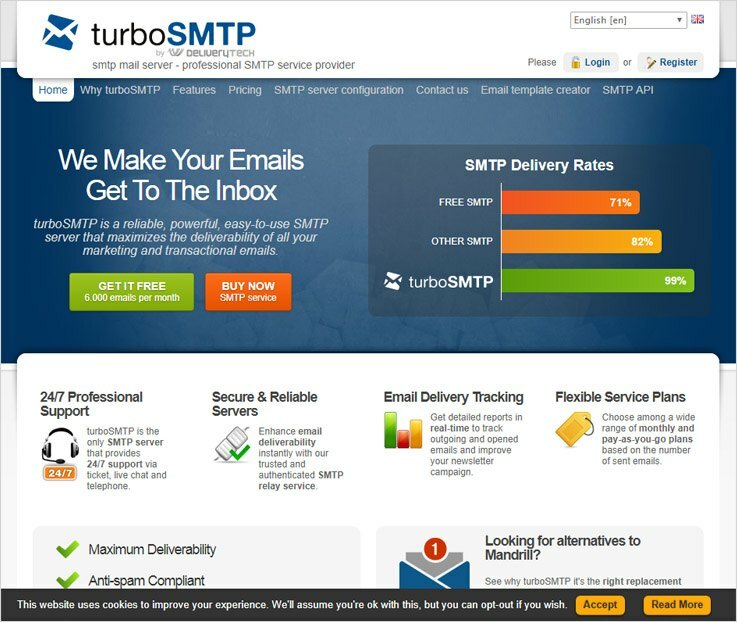 turboSMTP service assures high-speed email delivery with 24×7 multilingual customer support. The SMTP server also offers white-listed servers for better delivery rates along with bounce, spam and unsubscription management. The SMTP server has diverse pricing schemes which offer 24×7 customer support and unlimited email sending capability on every plan. Bronze – The plan offers 30,000 relays/month at the cost of $9/month. Silver – You are allowed to send 50,000 relays/month at the cost of $30/month. Gold – Send 100,000 relays/month with dedicated IP address by paying $70/month. Resell – Send 300,000 relays/month with dedicated IP address by paying $190/month. Titanium – The plan offers 500,000 relays/month with dedicated IP address in $310/month. Diamond – For the higher email sending needs like 1,000,000 relays/month, you can get this with the payment of $510/month. If your mass mailing needs are still not met, you can contact the sales team to get yourself a custom Enterprise plan. And, if you want to test out the server then you can sign up for their FREE plan which offers 6,000 emails per month (with 200 emails/day limit). If you want to save yourself from the hassle of monthly payment contracts, you can avail their Pay As You Go service. The list of the Pay As You Go plans start from the most basic plan which offers 10,000 email sending limit in $15 followed by 30,000 email sending permission in $35 and so on, which ends on the plan offering 1,000,000 emailing quota in $790. All the unused emails expire one year after purchase. 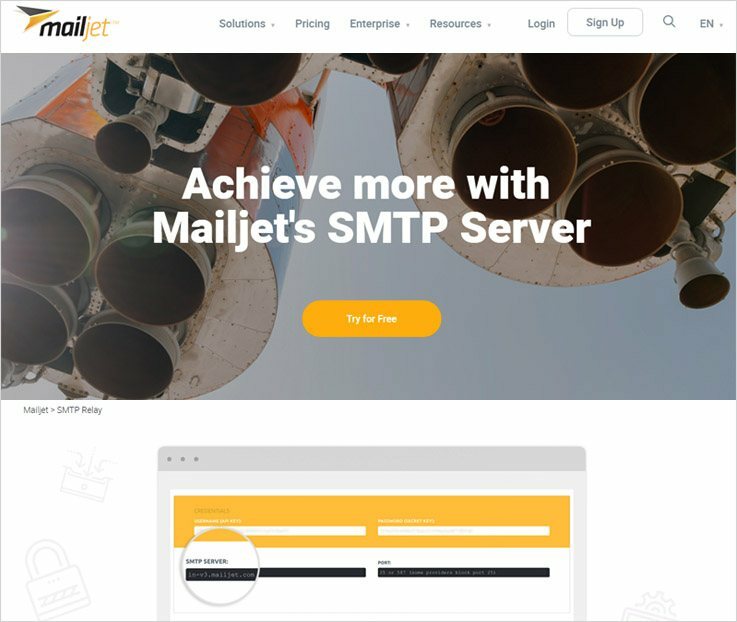 Mailjet is another example of an all-rounder mass mailing software which also packs its own SMTP relay server. 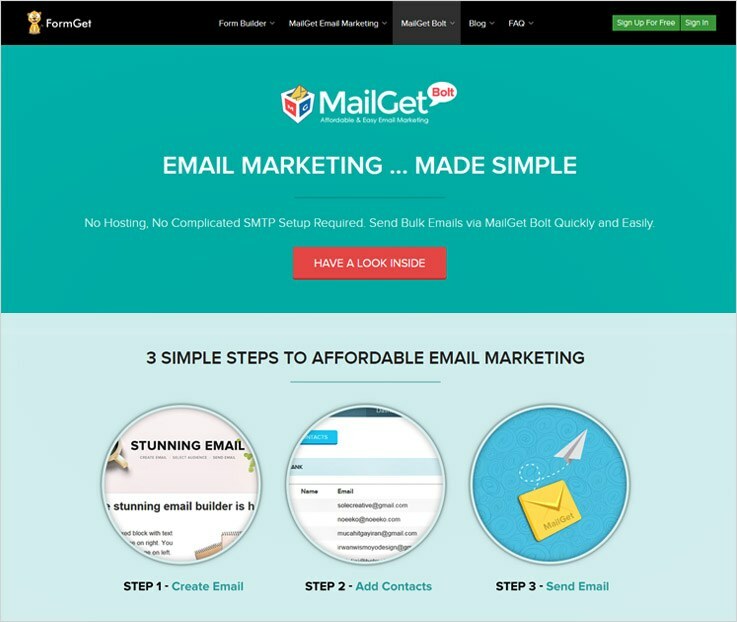 Mailjet is compatible with 80+ software and offers its services for marketing as well as transactional emails. Mailjet SMTP server incorporates real-time dashboard which authorizes you to monitor various key emailing metrics like opens, clicks, unsubscribe rate, etc. This SMTP service provider promises to improve your sender’s reputation by optimizing your delivery rates and keeping up with anti-spam regulation. 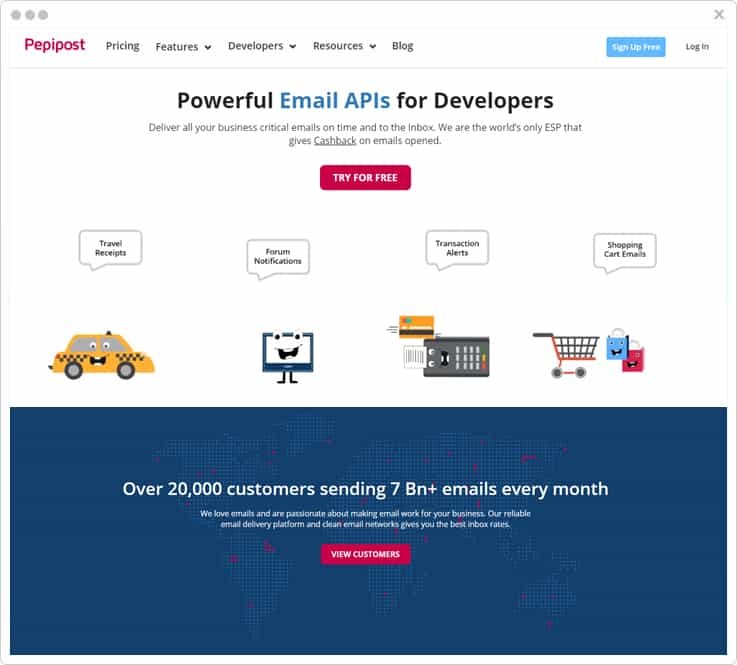 Apart from being a renowned bulk emailing and cheap SMTP servers provider, Mailjet also possesses plugins for WordPress, Joomla, Magento, and more. Free – Mailjet generously offers 6000 emails/month (200 emails per day) in its FREE plan with unlimited contact storage and full API access. Self-Service – This is the monthly plan of Mailjet which has various schemes embedded in it. Bronze – The plan offers 30,000 emails/month with unlimited contact storage and full API access in $7.49/month. Crystal – In this plan, you get 60,000 email sending quota for a month at a price of $27.95/month. Enterprise – This plan is perfect for organizations with higher emailing requirements. The plan provides dedicated account management services for the pricing of which you have to contact the Mailjet sales team. 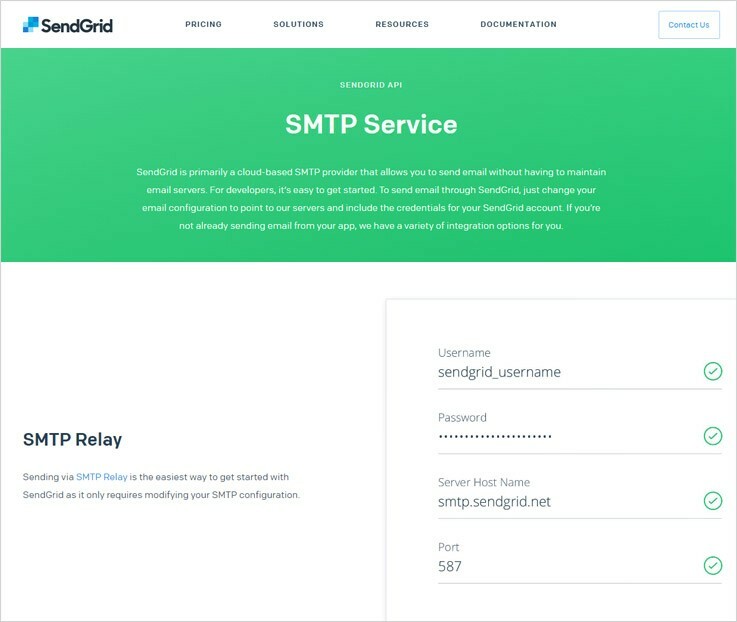 SendGrid is probably the simplest SMTP service as it negates the task of maintaining the email servers, hence allowing you to send emails through their cloud-based SMTP server. SendGrid offers 7 different API development frameworks viz. C#, Go, Java, NodeJS, PHP, Python and Ruby for quick SendGrid integration. SendGrid, apart from providing the best SMTP servers and relays, also offers emailing tools to facilitate your transactional and marketing email campaigns. This SMTP server is also backed by email deliverability experts, dedicated IP addresses and ISP monitoring. SendGrid offers affordable plans depending totally on your email sending needs, which is comprehensively described using a pricing calculator on its official webpage. You get to send up to 40,000 emails/month in just $9.95/month. $19.95/month would offer you 50,000 – 100,000 emails per month. Similarly, $57.45/month will increase your email sending quota up to 150,000 emails per month. $10/month will allow you to store contacts up to 10,000. 20,000 contacts can be stored by paying $20/month. And the remaining details can be fetched using price calculator. 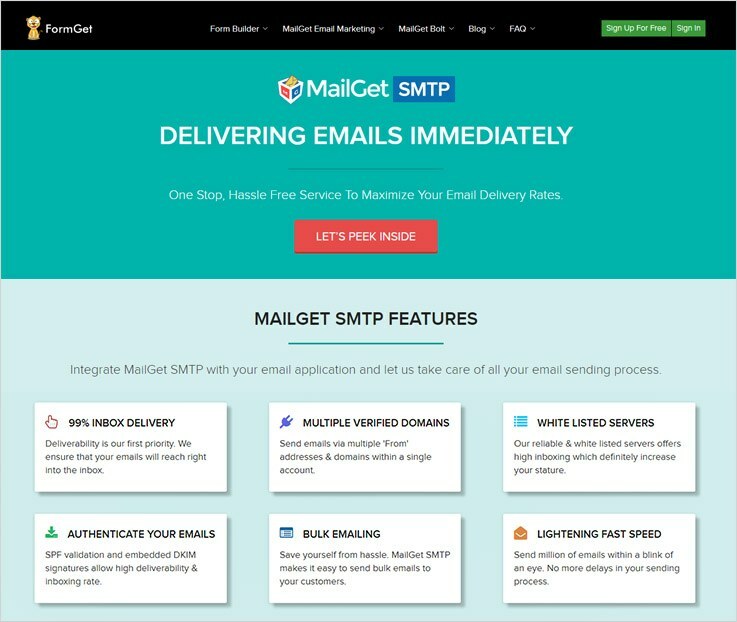 MailGet SMTP in recent times has been regarded as the best SMTP server because of its highly efficient functionalities and pocket-friendly pricing plans. To add more potency, MailGet SMTP is compatible with several esteemed email marketing software. One of the foremost advantages of using the MailGet SMTP server is that it offers 99% inbox delivery because of its whitelisted servers. This SMTP service provider also has an upper hand in managing your bulk emailing needs. In order to maintain or achieve a respectable reputation, this SMTP server is packed with SPF validation and DKIM signatures. As discussed earlier, MailGet SMTP offers its services in an extremely cost-effective manner. The plans offer you a pre-defined set of emails without any expiration date. In $5/month, you can send 5,000 emails. In $29 per month, the email sending limit is extended to 50,000. Similarly, for $79 and $132 in a month, you get to send 150,000 and 250,000 emails respectively. Lastly, with the payment of $419 per month you get to send 600,000 emails. All the SMTP service providers have been rigorously tested and then evaluated. Undoubtedly, MailGet SMTP tops the chart in terms of deliverability, managing bulk emailing needs and affordability. For sure, MailGet SMTP server is worth the try. Now that you have gone through the list of 5+ best SMTP servers and service providers, it’s time for you to make a much-informed decision to incorporate the best SMTP relay for your mass mailing needs. Have no doubt, all the listed SMTP service providers are very well renowned in providing hassle free services in an affordable way.